Are you afraid of eavesdropping on your online conversations? After the reports of secret surveillance program like PRISM, people do not want to trust on Facebook, Skype or other popular chat programs. If you want to have conversation with your online friends and conversation includes sensitive financial information, you can use ChatCrypt. 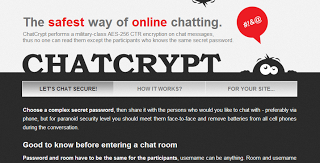 It is an online chat services that comes with military-grade AES 256-bit CTR encryption. And other participants will join the conversation via secret password. 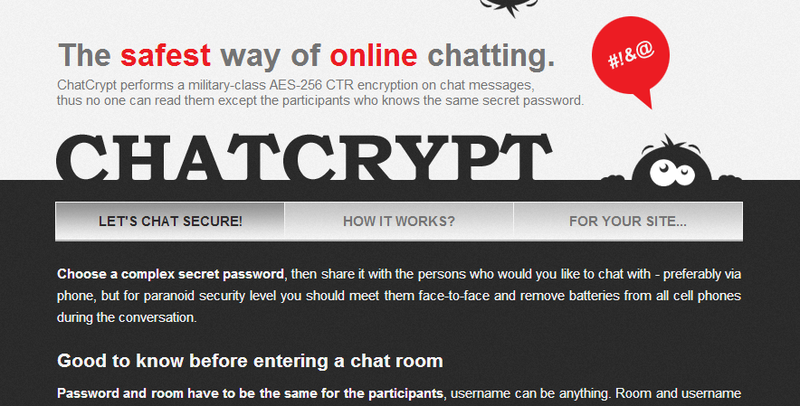 ChatCrypt has an advanced mechanism to protect your messages. It encrypts messages before it leave the browser’s front end by using AES-256 algorithm in CTR mode. It uses the user given password in the algorithm as key. So, decryption is only possible if attacker knows the password. On server side, there is no known solution to break the cipher. It also boasts that it holds encrypted messages in server’s memory for less than 10 seconds. So, there is no chance to retrieve even cipher texts from servers. To start this private and secure conversation, visit ChatCrypt.com. Enter then chat room name, username and password. After then click on “Secure Chat” button. It then pop a new window with chat room. 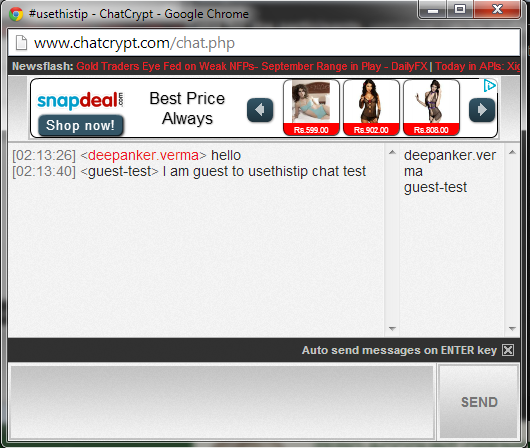 If any one want to join your chat, share the chatroom name and password with those people. At the left side, it contains the name of all people participating in chat. Although chatroom does not have many options like smileys, but it provide a safe online conversation. At least you know that nobody can spy on you. Start using the service for free and share your confidential information with other people online.